The Eastern European geo-political climate around 1990 was tensed and bound for fundamental change. All communist countries, including China, were impacted by the decay of the Soviet Union as a super-power, which culminated with the dismantling of the Iron Curtain, officially ratified in 1991. A series of civil protests also contributed to the collapse of communism in each of these countries. However, the Romanian Revolution stands apart by being the only one which took a violent turn while overthrowing a communist regime, as well as by remaining enshrouded in mystery even after 25 years, as to what actually happened on military and political levels during its course. Romania started making a difference in the Eastern Bloc after Nicolae Ceausescu rose to power and slowly began to take distance from the grip of the USSR. It all became too obvious with the end of the 1968 Prague Spring, when Russian forces invaded Czechoslovakia, an event thoroughly condemned by Ceausescu, who labeled the invasion as a “great mistake, a big danger for the peace in Europe”. In the following years, Romania remained an enclosed state for its people, much like any other communist country at that time, while thriving on foreign economic relations with the Western World. It was the only USSR member which established ties with the United States, a fact publicly acknowledged with Richard Nixon’s visit in Bucharest in August 1969. Nicolae Ceausescu fleeing away by helicopter. Ceausescu’s cult of personality and his ambition to pay off all of Romania’s external debt took a significant toll on the living conditions of the people. The 80s were marked by severe access limitations to food, energy and, most of all, information. Romanians were living under the fear of the ever watchful eyes of the Securitate, which was nothing short of a NKVD spin-off, much like Orwell’s 1984, where anyone could be a state enemy and anyone could be an informer for the Securitate. The first spark of public discontent was the 1987 Brasov Rebellion, where thousands of workers went on an unorganized protest against poor living conditions and delayed salary pay. The revolt lasted only a few hours, until local militia and Securitate forces quickly intervened and arrested most of the protesters. Another notable protest was conducted by painter Liviu Babes, who committed public suicide on a ski track in 1989, trying to let foreign tourists know of the abuses Romanians were subjected to by the regime. Needless to say, no news about any of these events were reported in the highly censored Romanian press. Stimulated by Gorbachev’s openness doctrine (glasnost and perestroika), a vibe of political change at the beginning of 1989 began to take hold of the Eastern European countries, starting with Poland and Hungary. One by one, each communist regime had been peacefully overthrown. In the case of Romania, aspirations for change took a completely different turn. 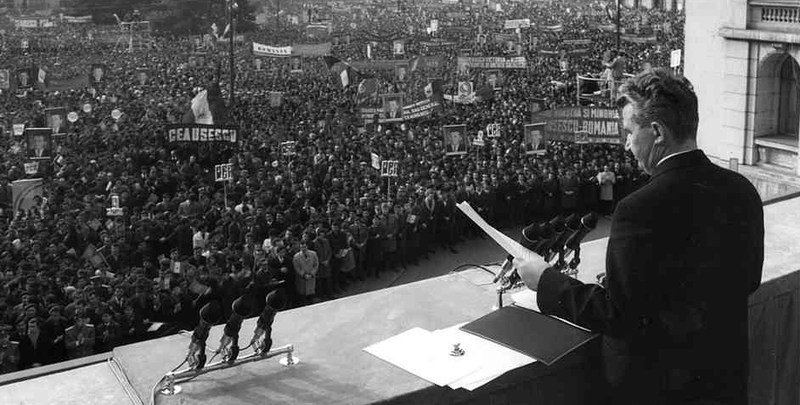 Being politically distanced from the rest of the Soviet Union for many years, the Romanian dictatorship remained immune to the wave of changes that Gorbachev imposed, thus being unsympathetic to the people’s pleas. 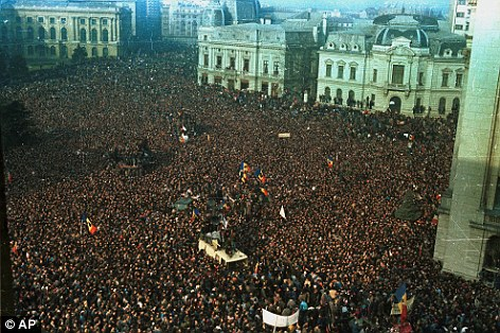 Thousands of protesters in Bucharest at the 1989 revolution to end up the regime. In December 1989 protests started in Timisoara and quickly disseminated throughout other major cities, including Bucharest. Military forces were asked to intervene by force, civilians got hold of guns and ammunition, the security did its best to confuse the protesters and, in the end, the generated chaos resulted in over a thousand deaths and several thousands injured. 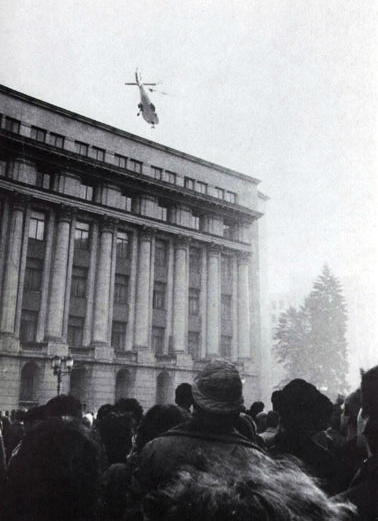 Ceausescu was quickly captured, tried and executed on Christmas Day. 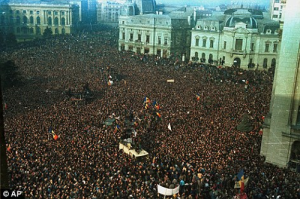 Despite hundreds of books written on this subject and hours of filmed footage, after 25 years since the Romanian Revolution, it is still unclear as to whether it was a highly organized coup or a genuine revolution, as well as if the ones shooting protesters were Securitate (security) agents or just other protesters. Enjoyed reading this article? Consider reading also about The Six Day War and The Chinese Civil War.